This is a great story - one whose message is very poignant and true, every day... Be free! The theme for March is 'Checked Out' and this week's theme is At eye level. I'll have to explain what met my eyes this morning. A few months back the school agreed to create a Lego Robo team with William and a few of his friends (3 boys and one girl for a team of 4). We received 2 Lego robotics kits from the board and proceeded to work. They built the robots, and I taught them to program it. First on the robot brick itself, very simple instructions (5 instructions only). Then on the computer - at the Pilot level, with simple steps and things like 'Go forward', 'Go backward', 'Turn a light on / off'. Then yesterday I introduced them to the Inventor level, which itself has 4 levels. I got them through Levels 1-3, with the possibility to add instructions for each motor, each sensor (it has light, sound, push sensors - and you can add more, like temperature), play music, as well as use loops, jumps, and forks (tasks running in parallel). What you see above happened in the morning: I woke up and the child was in front of the laptop, creating that quite complex structure, and testing it. It almost worked as he imagined it from the first time (couple of tweaks only were needed). Needles to say I am incredibly proud of him - of all 4 of them, in fact, they all grasped quite complex concepts very easily. Two of them work at empirical level (trial and error), while two actually study and check before testing. It's interesting to watch them, and it's incredibly rewarding to see their robot do what they wanted it to do. Wish us luck next Thursday! They dream of winning all they way to Nationals and going to Brazil (where the World competition takes place this year). In the meantime, they settled for ice cream: if they win, it's celebratory ice cream; if they loose, it's 'cheer-up!' ice cream. You must love their logic! Welcome to the 3rd reveal of The Creative Continuum of Seven Artists. If you're new to the CC7A blog hops, you can read about how we became in one of my previous posts: Introducing the CC7A. March is hosted by Sally Russick, of The Sublime Studio (the one and only of the Focus on Life! ), she chose 'Contrasting colours' as a theme and sent me these beauties... errr... yup, I forgot to take a picture *before* I started: I have to stop doing this, really! Luckily for me Sally did take a picture! mine is in the top right corner, the red and turquoise / aqua palette. I drove the package around for 2 weeks, at the studio I go on weekends... but I had to work on other items (check tomorrow's blog post for some extra details), plus my ingredients weren't available (keep reading for details :) ) and it wasn't until Sunday until I started on Sally's beauties. I had a fixation on a tassel, and I had another fixation on how to make it. You might remember I have 2 huge 'loves' when it comes to jewelry making: metal and glass. I don't have much opportunities to work on glass and I have wanted to try enamels for a long, long, looooong time. A few weeks back Dee (the lady who owns the studio) mentioned enamels and I had to be patient for either (1) her to find her own enamels or (2) her to get the new shipment of enamels. As luck will have it, #1 happened on Saturday so I got my chance on Sunday to finally work a little bit with them. This is the tassel 'wrapper' - for lack of a better name. I made it of copper, looks very much like a flower (a tulip), then I covered it in enamel: green, with a border of sparkling grey. The pictures are horrible, if you keep reading you'll also find why! Can you see the purplish-grayish-sparkly border on the bottom? It's truly lovely in real life, and the transparent peacock green gives the copper some interesting reflections. Since I was having so much fun with the tulip, I continued on with some head pins. Being limited on time, I took an unorthodox approach: instead of getting copper wire, ball it, then cover it with enamels, I took some ready-made eye-pins and covered them in enamel. It makes for a more flat 'bulb' at the end of the pin (you can see the original eye-pin in this picture, on the middle turquoise bead. With the tassel exactly as I envisioned it, I found myself in a bit of a 'now what?!' moment. I am usually going for simplicity, but this time I felt a little bit of chaos is welcome. Out came Tibetan silver, coral, and turquoise beads (which I bought from my Bead Soup #7 partner, last year, and never used), copper beads (which I did receive in another swap or challenge, but for the life in me I cannot remember who sent them to me), copper chain, the wire (of course), red leather and... wait for it, this one *is* funny: even the thread Sally wrapped her package with (the turquoise bit you see below)! Yup, another very long necklace. Not very proud of the pictures, but incredibly proud of the necklace itself (and the second pendant). In a very eclectic way, everything matches - there are 5 different types of metal in there (silver, 3 different coppers, and the antique copper) and they are somehow OK together. The colours would be perfect together: turquoise is the common denominator for copper, the bright red, the coral, and the peacock green. 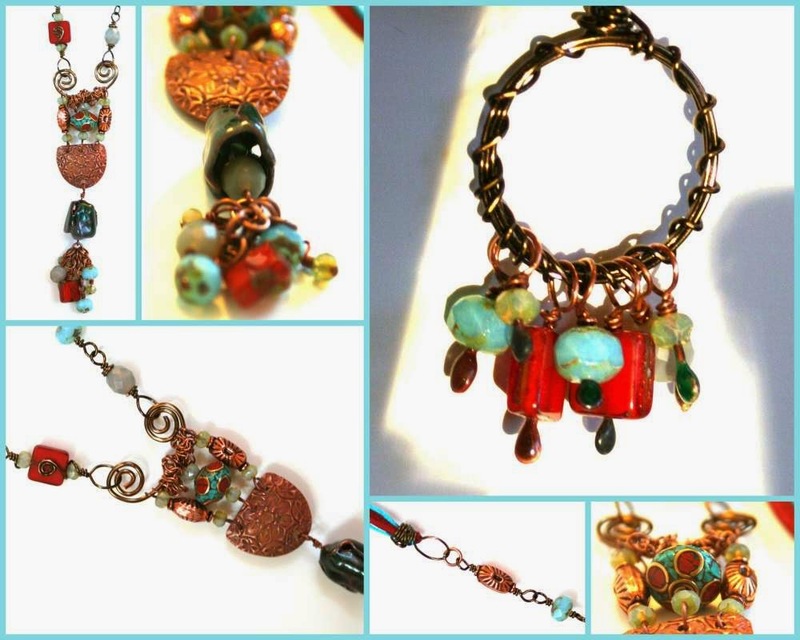 There are so many elements: Kristi Bowman's copper elements, the Tibetan bead, the copper beads, the enameled tulip, the 3 different type of beads - and yet somehow everything is just perfect together. It is fluid, it is colourful, it is asymmetric, it whispers secrets of the East, and invites you to some adventures in the West. It's my 'East meets West' piece (well, 2 pieces, to be exact). Sally's beautiful package (we had an ad hoc contest, with all of us claiming her package is the prettiest) inspired me beyond my imagination this time. I am incredibly proud of the enameling parts: they came out exactly as I envisioned them, and the process is easy and fun (yeah, you guessed it correctly, you'll see lots of enamels from this girl). And solves one of my issues in a perfect way: it covers the metal base so I'm not allergic to it anymore. Did I mention I love the look of it?! Glass and metal: my 2 loves in one element. Yes, I am excited :) But I should stop here and thank Sally for her generosity and for firing this spark in me! And the entire group for making this special event possible: it turns out to be one of the most fun and most enjoyable ever, with every reveal it becomes more and more interesting. I am thanking you, too, for stopping by today! I hope you have enjoyed this new adventure - and please make sure you visit the entire group (it's a small one). The Spring edition of the fabulous Bead Chat eZine has just been published, hot from the press. Sadly, I didn't have time to get my articles in, however I'll be back next edition. This month's CC7A is sponsored by Sally of The Studio Sublime and she just posted the packages she sent out. Aren't they a beauty?! Can you imagine having to work with one of these lovely pallets?! This coming Wednesday, on the 26th of March, you're all invited to see the reveal, they'll be yummy, I'm sure. The theme for March is 'Checked Out' and this week's theme is Expression. 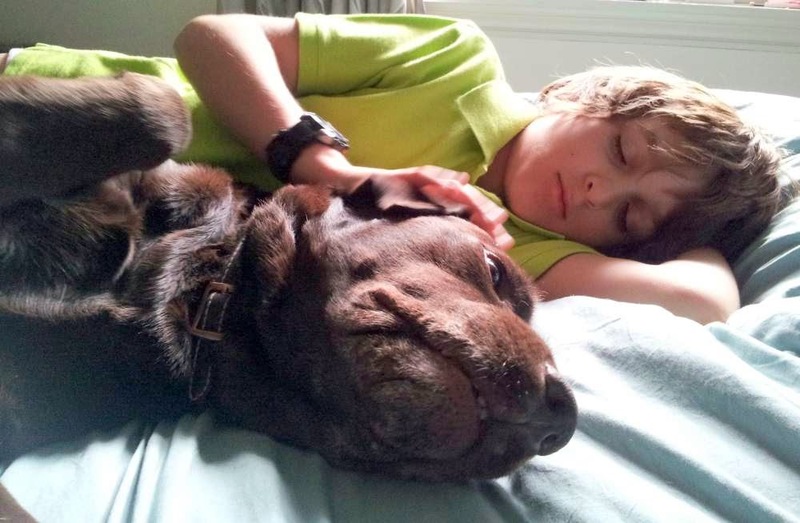 This is from the category 'A boy and his dog' ~ and while I don't have enough pictures of them (the dog is not a camera-friendly one, she's way too curious :) ), I have endless memories of their cuddles. 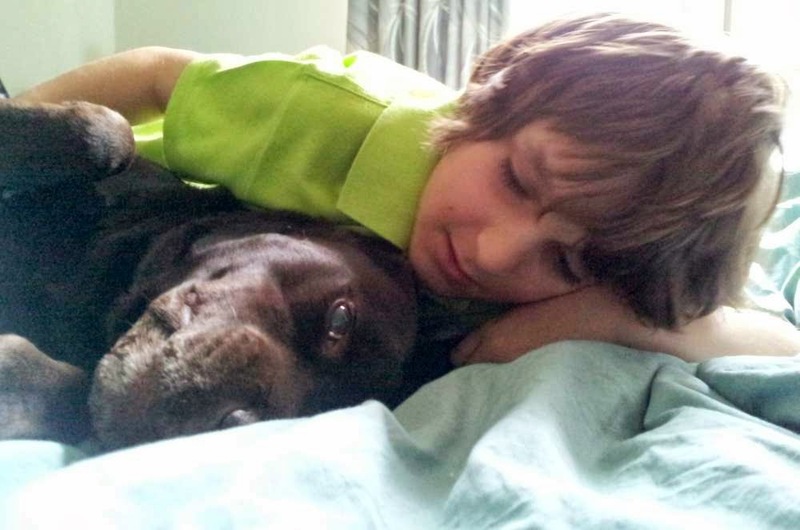 They love each other to pieces, that unique, remarkable love between a child and his dog. To see how everybody else captured the Expressions of March, please check below. This should need no introduction: Canadian astronaut Chris Hadfield speaking about his experience. Bead Soup BP#8 - My soup ingredients are here! I've been participating in Lori's event since #5, I believe... if you're new to the world of artisan jewelry making, Lori is a wonderful soul who is organizing a humongous party: pairing artists from all over the world, the bead soup partners send each other the 'soup' aka dry ingredients that might or might not work together, with extras more times than not. Only an art focal and a non-commercial-made clasp are mandatory, but I've seen amazing 'soups' in these past 2 years, and this year is no exception. My partner for this adventure is the lovely Penny Neville of Copper Penny Designs - a fellow Canadian artist from Alberta. We have exchange a few emails, learned a little bit of each other, and sent our soups. 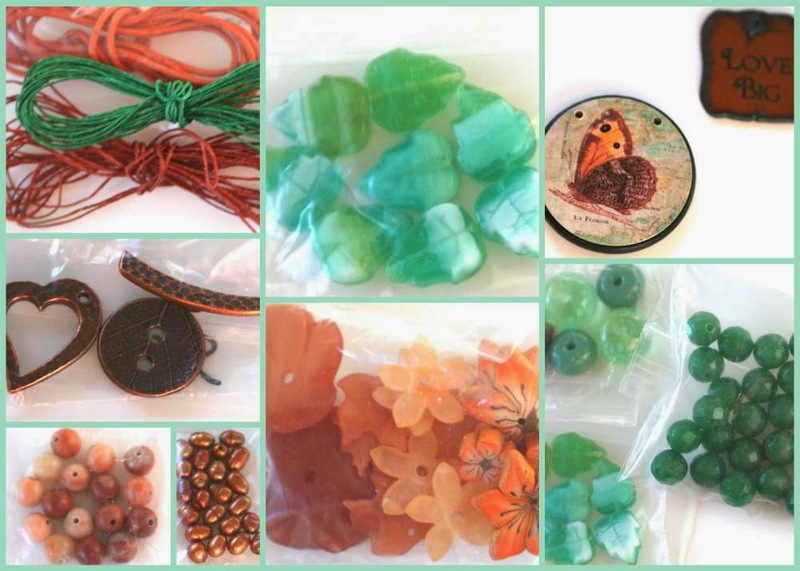 We discovered we are very much alike, we share the same love for gemstones, earth-tones, natural fibers, and organic designs. She also doesn't work in pink / red ~ she must be my lost-at-birth sister, 'cause I've been always challenged by pink and gravitated towards greens and blues. One of my focals is a pendant made by the lovely Marie-Noel Voyer-Cramp of Skye Jewels. Little did Penny know I have been in love with Marie's work for a very long time and I've been admiring her lovely pendants. Now I own one myself, lucky me! There is another pendant in there, from rusted iron, (by Lipstick Ranch) with a 'Love Big' message. Perfect! My soup is in its bowl... simmering... and lovely. The reveal is in on the 3rd of May, just in time for my birthday - and the funniest part about this soup? One of the linen is 'emerald', which is my birthday stone. I guess I'll have to make myself a special birthday present, don't I? Thank you, Penny, for this amazing soup! And thank you, Lori, for organizing it every year, despite everything that's pilling up on your plate. I hope you'll come back for the reveal, it will be a huge one, but from my past experience one filled with beauty. 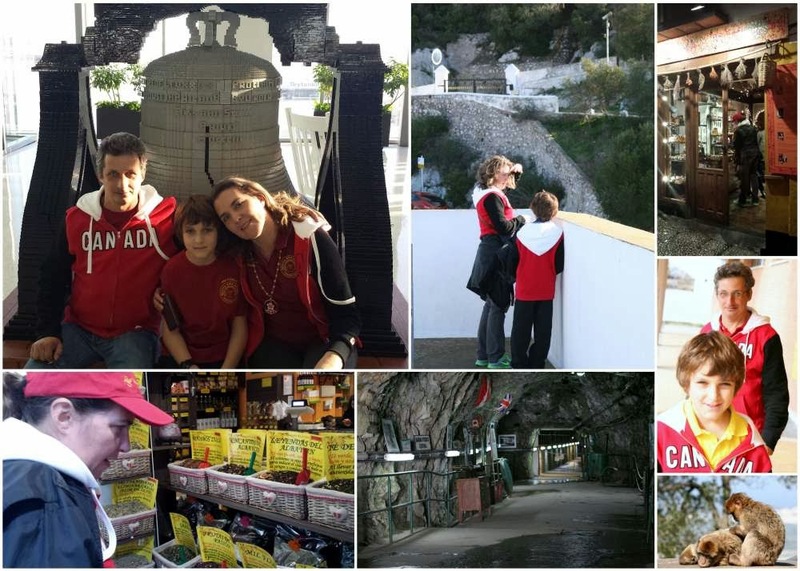 Focus on Life ~ March, 'Checked Out': Week 11 "Beauty All Around"
The beauty that is all around us, the beauty that we sometimes miss because we are busy with the daily activities we "need" to accomplish. This week let's slow down and smell the roses, feel the sunshine and enjoy the beauty that abounds in our world! Ah, yes - ironically enough this week seems busier than the one before, and I know the next 4 weeks or so will be plain crazy. But I also know the importance of slowing down (no roses around here yet, we just had another 10 inches of snow dumped on us a couple of days ago) and since today has been a spring-like day, I got the child and visited one of our favourite spots: Crawford Lake, The Iroquois Village. The park has a very rich history, it is built around the Crawford Lake, right through the Niagara Escarpment, and Bruce Trail. In the 70s the scientists discovered the lake is meromitic: because the lake basin is deeper than its surface area, the lower levels of the water are rarely disturbed by wind or temperature change. Because there is no mixing of lower and higher levels of the waters, the bottom of the lake has no oxygen, and no life, hence no bacterial breakdown. Which makes it a perfect sedimentary preserve. That's how they made their second important discovery: they found corn at the bottom of the lake, corn over 500 years old. So they rightfully deduced there must have been a settlement close by and started archaeological studies, and they soon after discovered an entire Iroquois Village 100 m away from the lake. 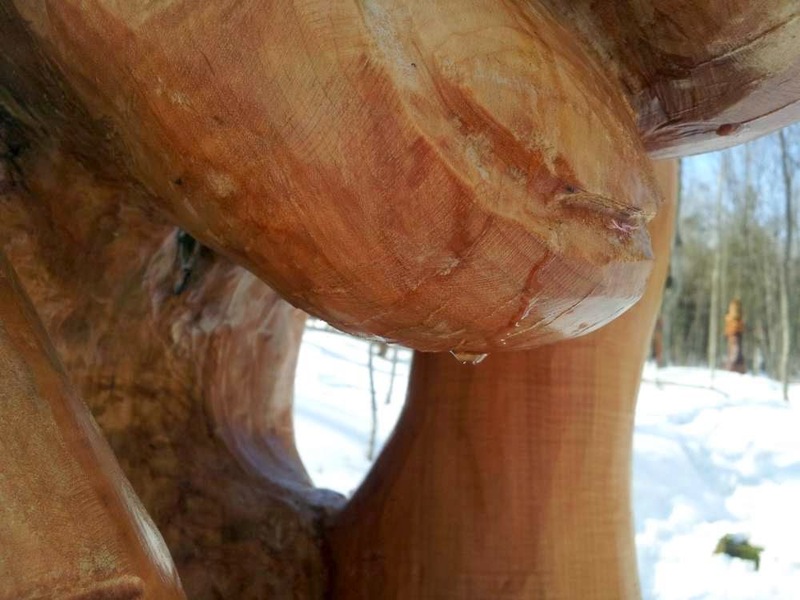 Today there is the Conservation area, with wonderful trails (around the lake, through the forest, or to another Escarpment spot, 7.2 km away), and reconstructed long houses where you can learn about the life of the Iroquois people 550 years ago. During March (and sometimes April too) they host (like many parks around us) the Maple Syrup Festival, in here it is called Sweet Water Festival. You learn about how the Native people made syrup and sugar out of maple sap, you eat cornbread with maple syrup, you learn original ways of making corn pancakes, you eat maple taffies made on snow (yummy! ), and ultimately you have a lovely walk through the forest. 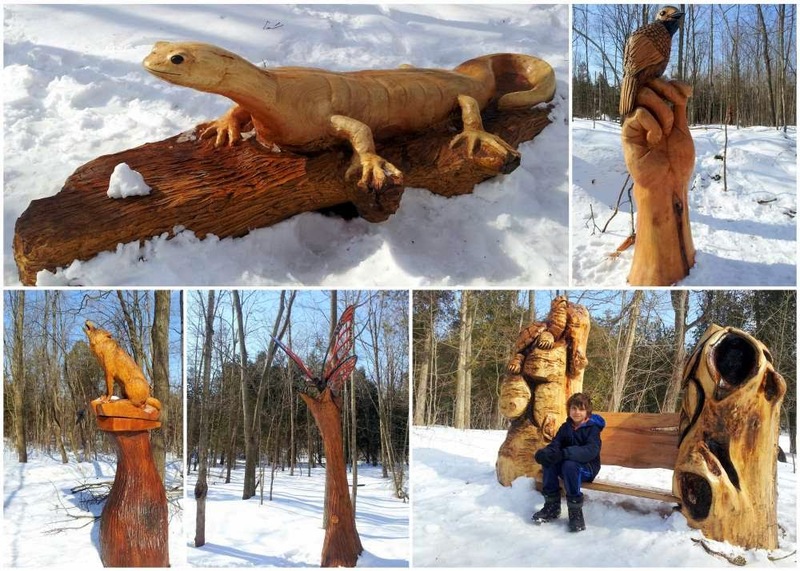 Over the winter (we've been there in the fall last time) these lovely wood sculptures were installed. Gorgeous and perfect in the natural setting: it's simply wood and a bit of colour given by the contrast of wood to the burnt wood. The animals are very realistically depicted, you almost want to touch them to make sure they are not real. You touch them anyhow, because the wood is just calling you. The hand holding the large bird seemed to be 'crying' and it took me a little bit to discover a small patch of snow on top of the hand (higher than eye level). My only regret is that the wood is sealed, so you can't smell it - I can imagine how it must have smelled while the artist cut through it. That's the Beauty All Around us this week! To see more beauty, please make sure you visit everybody else. Oh, dear, I am waaaaaay behind in the Focus On Life journey! Many excuses, but that doesn't help with keeping up with life, does it?! I'll keep it short on words and just do a quick catch-up. This one is from the Spain trip, at the Mediterranean Sea, in Salobreña. 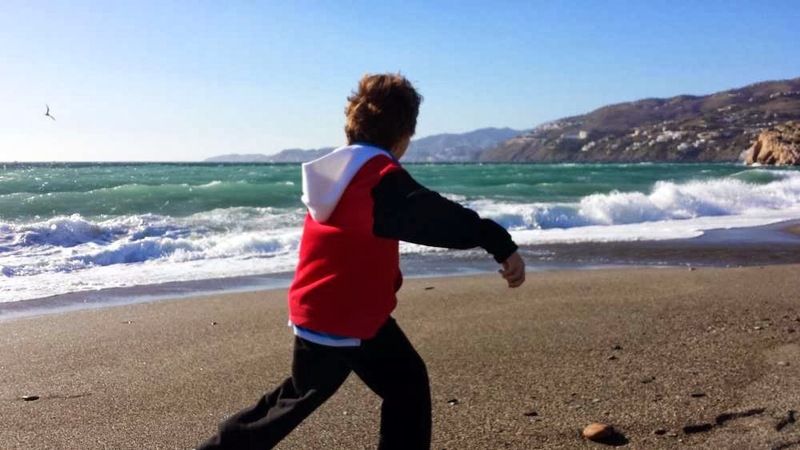 You can't get more outside than this (William was running along the shore). 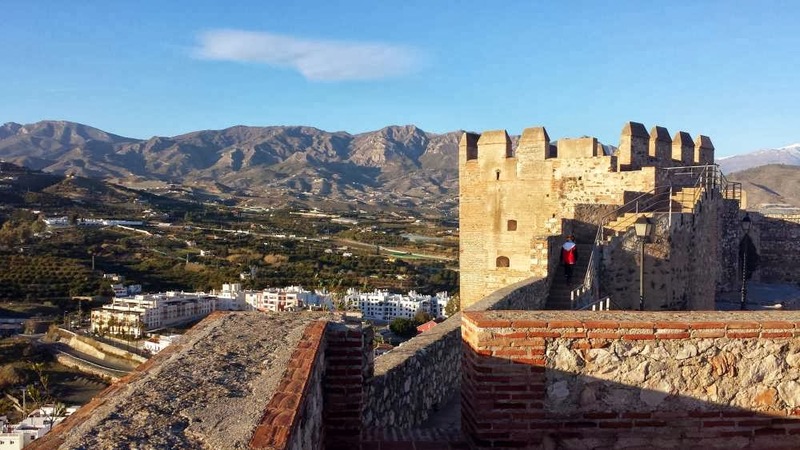 Same Salobreña, visiting the Moorish Castle. It was quite unbelievable: the combination of pure green sea on one side, the Sierra Nevada Mountains on the other, with the white city spread over the hill, the Moorish castle on top, and both farms and a seashore resort at the bottom... it was very much a clash of multiple cultures in a quiet way... and very old... Beautiful. 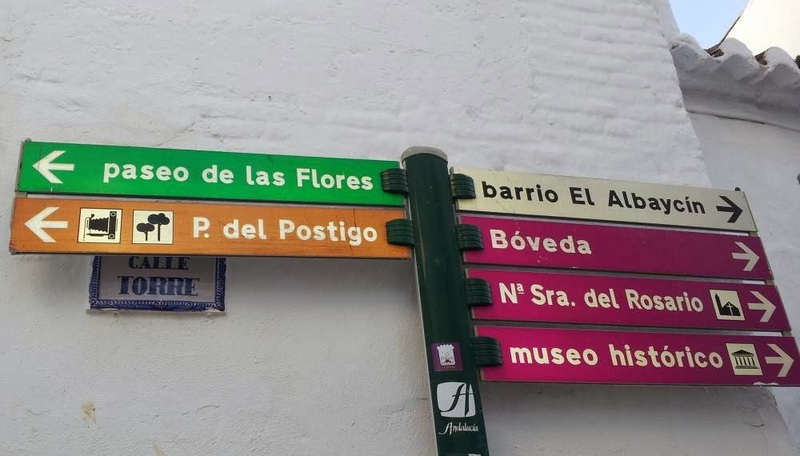 I have 2 pictures: one from the streets of Salobreña, they actually coloured their street signs. It was cute. Ah... the scents and tea and soaps shop, in the centre of Granada. 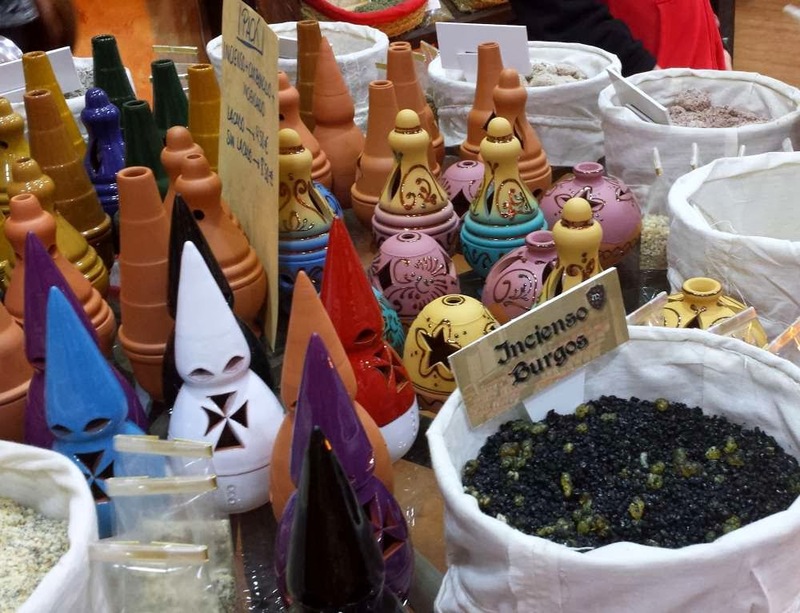 I must admit I didn't know what to think about the inquisitorial incense vessels, they made me cringe a little bit. The colours, though, were incredible - and I settled on the turquoise egg-shaped one (you see a small bit of it right in the picture). Choosing the incense was another issue - they were so many, and so different, and you couldn't buy the whole store! This would conclude the month of February. For March, Sally of The Studio Sublime chose the theme 'Checking Out'. Not macro in the sense of using the macro lens or settings... but a true macro image: this is the detail of the incredible (and I mean absolutely amazing!) stone lacing found in the Moorish castles. Imagine a huge place all covered inside and outside, walls and ceilings too, all in this lace. Now try to imagine how long it would take for humans to complete such intricate lacing. And try to imagine it's done in stone. And abut 1,000 years old. 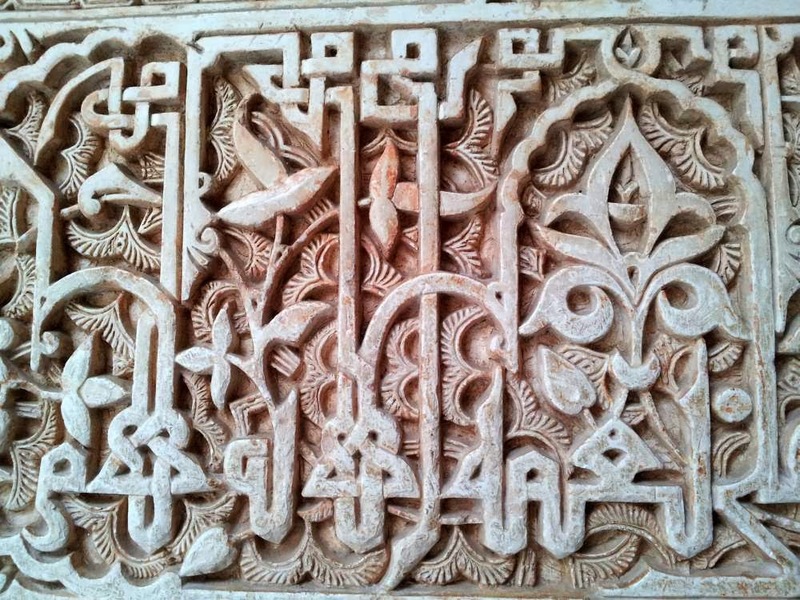 I could speak all day about it ~ this is a detail from the Alhambra, the Moorish Castle built in the mid of 11th century on the hills of Granada. 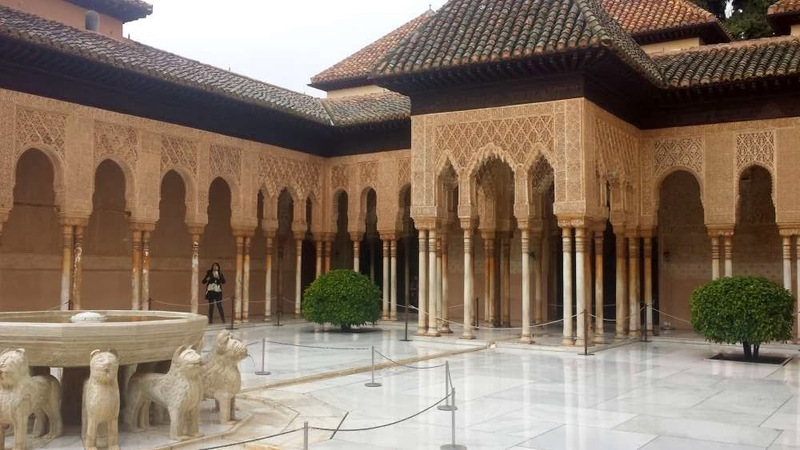 Moorish poets described it as "a pearl set in emeralds," in allusion to the colour of its buildings and the woods around them; it is a true pearl and I will come back with more pictures and details about our tour there. Couldn't resist - this is the big picture of the Macro above. The exterior walls are covered in lace, the interior walls are covered in lace, the ceiling is covered in lace - even the columns are decorated with lace! Mouth dropping. The image above is from the Court of the Lions and the Fabulous Fountain - a court of 35 m by 20 m, with 124 white marble columns. On each of the four sides a pavilion like the one seen here projects into the court, with filigree walls and a light domed roof. The square is paved with light grey tiles, the columns are covered with white marble, the walls are covered 5 ft up with blue and yellow tiles, and then decorated with the laced stone. The 124 columns are irregularly placed, and adorned by foliage, stucco arabesques, and over the pillars with more filigree work. The Fountain of Lions in the middle is an alabaster basin supported by 12 lions in white marble - as a symbol of strength, power and sovereignty. At the edge of the fountain there is a poem written by Ibn Zamrak. The poem is carved in stone and praises the beauty of the fountain and the power of the lions, but it also describes their ingenious hydraulic systems and how they actually worked. The whole castle is an ode to the power of water and an example of the Arabic genius at architecture, design and engineering during that time. Below you can catch up with everybody else, please make sure you visit and admire their Big Picture! But this little boy is continuing his journey through the teens - as he turns 11 years old today! May I see you grey and combing your grandchildren’s hair. Sharyl of Sharyl's Jewelry had recently gone through what every serious artist must go (some more often, some less): having to clean the mess in her studio. Nobody likes to clean alone, so she had this brilliant idea of inviting everybody to join her in the 'Studio spring cleaning' (where 'spring' is a term loosely defined as 'the season that should follow winter and theoretically starts in about 3 weeks'... which term definitely doesn't apply to where I live, as we haven't seen the face of the driveway since November; currently it is fully covered by about 3"-4" of ice). Hence this challenge / blog hop where we are supposed to clean our studio. Last evening, after finishing everything else that had absolutely had to be done, around 10:00 pm I decided to tackle at least some areas, went up, took the picture above and proceeded to put things in their places. Update ~ March 1st, 10:00 pm: I actually managed to get step 1 above *done*! It is a miracle, because in the process I cleaned up a quarter of the attic too (where packaging supplies were scattered all over) and I now have all my packaging supplies all in one lovely place. The downside? I don't have as many beads as I thought I have :) Or I managed to use part of my stash in the past few months. I also found a mini-project my mom sent me so I'll have to get to that in the near future.